All products or services are owned and provided by Kate Drennan Photography (“Company” “Kate Drennan” “KDP” or “we” or “us” or “our”). The term “you” or “your” “couple” or “client(s)” refers to any user or purchaser of said product(s) or service(s). Kate Drennan Photography reserves the right to update and change these Terms at any time and will update them accordingly with the ‘date last updated’ at the top of this page. You are legally bound to these Terms whether or not you have read them. If you do not agree with any of our Terms, please email Kate Drennan at info@katedrennan.com and I will make reasonable efforts to remove your name, email and access to our services and website. All Images on this website are copyrighted and not to be copied or reproduced without written permission from Kate Drennan Photography. All information on this website is from Kate Drennan Photography’s Point of View and should be used as a guide only. All text, wording, images, graphics, logo, taglines and trademarks are owned by and the property of Kate Drennan Photography. It is a violation of federal law to use any of Kate Drennan Photography’s intellectual property in whole or in part. You may use images you have purchased for personal use only. You may not reproduce, give or sell to third parties including media and vendors. You may not claim ownership or use any of my intellectual property without prior written consent. Please send vendors to info@katedrennan.com to request correct usage terms and images. If you wish to use or refer to any content by Kate Drennan Photography, you must do so by requesting permission prior to commencing use or any motion to use in the future. For more Copyright information and how to use images with permission without breaching copyright infringements please visit here. Quotes are valid for up to 7 days but your booking is not secure until a non-refundable retainer is paid into the nominated account and contract signed by the client and photographer. Bookings are based off a first come first serve basis and in the event of another client booking this service prior to the deposit hitting the photographers nominated account this job may be voided and deposit returned. All invoices must be paid on or before the date due stated on the invoice or the studio may void the job whether booked or not. Invoices are final and cannot be changed or cancelled unless approved by the business owner. Any extra service or products will be priced accordingly to the price list at the time of the change, and not the original price at the time of booking as prices of goods and services may have changed. Kate Drennan Photography retains the copyright for all images. When purchasing the digital negatives, the client may reproduce the images for personal use but may NOT SELL these images. Kate Drennan Photography has the right to use your images for all publications, websites and advertising material. If you do not wish your images to be used, you will need to advise the photographer and Kate Drennan BEFORE you book and these terms will be altered. All images and digital files are protected by Australian and International Copyright Laws and remain the property of Kate Drennan Photography. Images are for everyday use on social media and websites or small run brochures. Credit is always appreciated by the client but not mandatory if images are paid for in full. Any vendors or Services who have not paid for the photography service and images MUST CREDIT the photographer or legal action may be taken. Any images used for Print Ads, Point of Sale (in-store) or outdoor (billboards, bus shelters, busses etc) will incur an extra usage fee to be discussed with the photographer. It is illegal to download, screen capture or reproduce any images whether purchased or not without the approval of Kate Drennan Photography. All images you receive must not be altered unless approved (this includes Instagram filters). Images must not be distributed to publications of third parties without getting permission from the photographer. Vendors / other services involved in the shoot or wedding may be sent the images by the photographer. The client has the option to mark any images as private, these images will not be shown to others. Electronic Debit Fund Transfer or cash payments are accepted. Credit card payments will need to be requested for prior to your invoice being processed and may incur a higher rate. We reserve the right to change these Fees at any time without notice. Any monies paid (non-refundable retainer and balance) will not be refunded under any circumstances. Orders can’t be changed or cancelled. You have the right to terminate your booked shoot at any time. Please send an email to initiate this process. For weddings in Perth and Down South, Balances to services, if the services date is more than 1 month away, will be voided and do not have to be paid. If cancelled within 4 weeks of the job date, any monies paid will not be refunded. Any existing balance that remains after 14 days from the date of termination will be sent to a collections agency, and you agree to be responsible for any additional charges, fees or costs associated with such a collection effort, including but not limited to reasonable attorney’s fees and court costs. Destination Wedding Termination will not excuse you from further balance payment. Upon confirmation of your termination, any and all outstanding balances will become immediately due and payable within 30 days. By accepting these terms and booking this service you hereby automatically are bound into a model release agreement allowing Kate Drennan Photography the right to photograph, publish and use any and all images taken of the client, guests and anyone present during your shoot for web and print purposes, regardless of age or relationship to the subject. Images may be submitted to web and print blogs and magazines and used on Kate Drennan Photography’s website and social media. Images may also be sent to vendors who have worked on the shoot. KDP is not obligated to notify you or anyone of the use of these images. The photographer will only supply finished processed JPG images in the stated resolution in your booking. RAW files will not be released. Online galleries are available by request for guests to view/download/ purchase images. These may be included in your package or purchased as an optional extra. It is your responsibility to request password protection on these galleries, or a client login password to mark any images as private before sharing publicly. It is your responsibility to protect this password and any other means of unauthorised access or use of these images or any other means which may violate these terms and conditions. KDP does not store any credit card information, instead, these are processed through a third party processor such as Stripe or similar. By using these methods instead of bank transfer you indemnify KDP and instead assume any and all risk or liability for the security of payment details and agree to be bound by the third party payment processor’s applicable terms and conditions of usage. Gift vouchers are available and make ideal personal and thoughtful gifts. Only one gift voucher per shoot may be used. Remaining balances will be kept as store credit. Not redeemable for cash. Once images are handed over to the client, Kate Drennan Photography is no longer liable for these images any longer so please make at least one backup copy to another hard drive and/or the cloud/ Dropbox. Kate Drennan Photography will endeavour to keep images on file for a period of 6 months in case the client would like to purchase prints or extra images but this cannot be guaranteed. The client is responsible for all insurances required for the shoot. Kate Drennan Photography is not liable for any negligence on our of anyone else’s behalf. Public Liability and Personal Indemnity is the responsibility of the client and the photographer will not be help accountable under any circumstance. To the full extent permitted by law, KDP expressly excludes any liability for any direct, indirect or consequential loss or damage incurred by you or others in connection with the shoot or consult meetings. This includes without limitation any liability for any accidents, delays, injuries, damage, loss, harm, death, loss of profits, loss of money, personal or business interruptions, misapplication of information, physical or mental disease condition or issue, physical, mental, emotional or spiritual injury or harm, loss of income revenue, loss of business, loss of data, wasted time and any other loss of damage of any kind, however and whether caused by negligence, breach of contract or otherwise. KDP makes all reasonable effort to provide you with the most reliable and up to date USB drives, online galleries and booking forms and contracts but is not liable for any failure out of their control. The client is responsible for backing up and making copies to their images, contracts, timelines and all other content provided. 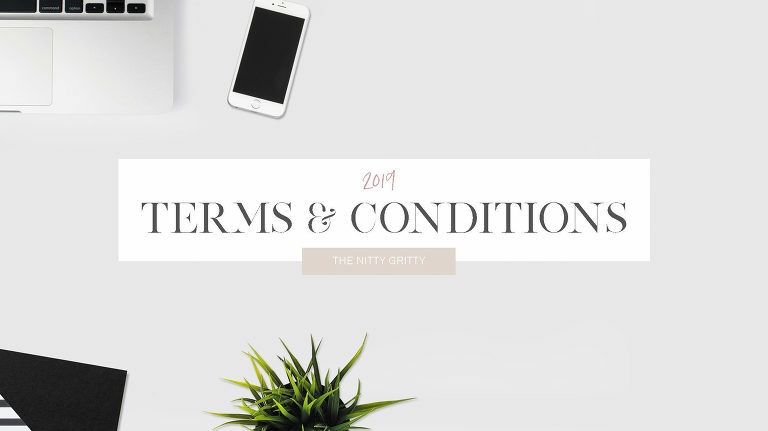 All rights not expressly granted in these Terms and Conditions of Use or express written here are reserved by Kate Drennan Photography.